Minute pirate bugs (also known as flower bugs) are small, fast-moving predacious insects in the order Hemiptera and family Anthocoridae. Orius is a true bug, which means it has a long rostrum (feeding tube). It uses its rostrum to pierce its prey, and drain the contents, killing the pest. There are several species of minute pirate bugs in the genus Orius. Although Orius are polyphagous, they often show a strong preference for a particular type of food. They can feed on all stages of thrips, aphids, mites and other small Athropoden (arthropods). Occasionally the flower bugs also feed on plant sap, but usually without inflicting great damage to the plant. The species Orius laevigatus naturally occurs throughout the Mediterranean basin, from the Atlantic region of Western Europe to the Eastern Mediterranean, including Israel. Orius majusculus is a native of Central and Southern Europe and Asia Minor. The latter type can spontaneously migrate into greenhouses especially in July and August. In Europe the species Orius laevigatus is used most often as a biological control, Orius majusculus is used to a lesser extent. Orius insidiosus is widespread in the US and Canada and is also found in Mexico, Central and South America and to Cuba, Puerto Rico and other Caribbean islands. It is used in America for the biological control of thrips, but should not be used in Europe because of possible disturbance of the natural ecosystems where invasive species can drive local native species to extinction. Orius are hemimetabolous, meaning that they do not undergo the complete change of form between a larval phase and an adult phase in the way for example a butterfly does. Instead, their offspring are called nymphs, and resemble the adults to a greater or lesser degree. The nymphs moult several times as they grow, and each instar resembles the adult more than the previous one. Wing buds grow in later stage nymphs; the final transformation involves little more than the development of functional wings and functioning sexual organs, with no intervening pupal stage as in holometabolous insects. 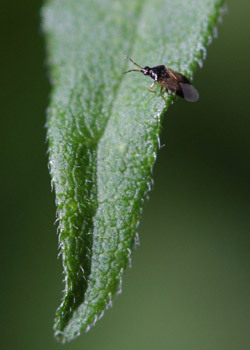 Adults are about 2–5 mm long, oval to triangular in shape, somewhat flattened, black and have a characteristic white patch on their back. Nymphs are colorless when they hatch, darkening to yellow, then dark brown as they grow. Fifth-stage nymphs have wing pads. All nymph stages have red eyes. All stages of Orius move very quickly. The adults are good flyers and move efficiently throughout to locate prey. Adults are attracted to, and often found in, flowers. Orius spp. occasionally may bite humans, but the bite is only temporarily irritating. 2-3 days after mating females lay tiny eggs within plant tissues (main stem, leaf vein, flowers or petioles) where they are not easily seen. These hatch into nymphs which develop through five wingless nymphal stages. Egg incubation is generally 3-5 days, and development from egg to adult takes a minimum of 20 days under optimum conditions. Females lay an average of 129 eggs during their life spans, and adults live about 35 days. Females stop laying eggs when the daylight is less than 12-14 hours and Orius will diapause when day lengths are less than 11 hours. Several generations may occur during a growing season. Optimum conditions are temperatures over 59°F (15°C) with relative humidity over 60%. Females lay the most eggs at temperatures between 20°C and 30°C. Above 30°C egg laying slows down considerably and survival of adults and nymphs is reduced. Higher temperatures and a good food supply are more important than the type of plant or relative humidity for rapid population buildup. The minute pirate bugs Orius laevigatus (Europe) and Orius insidiosus (USA) are voracious beneficial insects against thrips. Adults eat all mobile thrips stages, while nymphs prefer thrips larvae. Orius will feed on virtually any soft-bodied insect that is small (close to their size or smaller). They are particularly fond of thrips, mites, aphids, whiteflies, leafhoppers, many kinds of insect eggs, and tiny newly-hatched caterpillars. Moreover, Orius also eat pollen, which enables them to build up a population in pollen bearing crops without the presence of prey. Both immature and adult bugs can consume numerous prey daily. 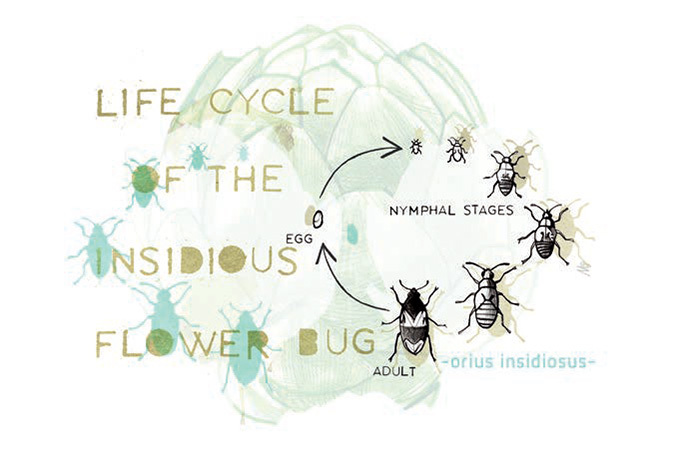 For instance one study estimated the prey consumption of Orius to be 30 spider mites per day. They sometimes kill more prey than strictly necessary for their own feeding. Orius holds its prey with its front legs and inserts its beak into the host body, generally several times, until the soft body is empty and only the exoskeleton remains. Orius are also available commercially for mass release, particularly in greenhouse settings. Only use products that are permitted in your country/state and crop. Check local registration requirements. CANNA cannot be held liable for unauthorized use.